By participating in this Group Buy all participants agree to release www.doityourselfchristmas.com, its Owners, Administrators, Moderators or any other staff of any and all liability and waive all rights I may have under all laws and governing bodies. By posting in this thread you agree you are entering a binding contract between the Organizer (me) and the Participant. In order to participate from this forum, you MUST be a supporting member per the GB rules. This post has been updated for the first round of 2017 Group Buys. This buy will last 3 weeks, ending on February 10th and I expect to start shipping boards out the week of March 13th. All orders for the group buy must be placed and paid for by midnight on 2/12. The cost will be the same as the last group buy, and I'll be using Google Forms with PayPal invoicing again for order placements. Details are all below! The ESPixelStick is an E1.31 WiFi pixel controller built around the ESP8266 in an Arduino environment. An overview of the ESPixelStick V1 is available here, and I'll expand on the V2 changes in just a bit. The ESPixelStick supports up to four universes of WS2811 pixels on a single output, or up to 63 GECE Pixels. The firmware is open source, available here. Once connected to your WiFi network, further configuration can be done via the embedded web server. 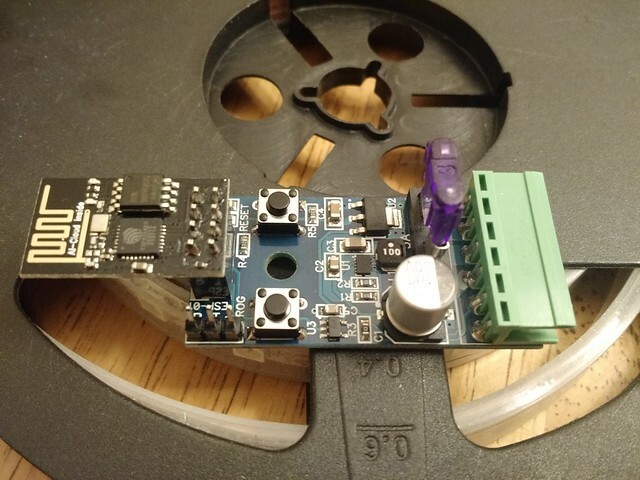 The controller is small enough to fit inside 1" thin wall PVC, allowing you to embed the controller next to your element eliminating issues of long pixel runs. The ESPixelStick V2 is provided in kit form, with all SMD components pre-soldered. Please feel free to address any questions or concerns in this thread, thank you! 1) Power supply section is completely different. 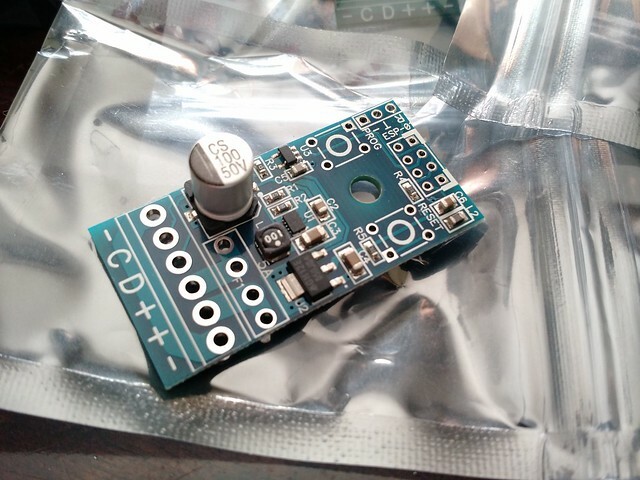 It has an on board buck converter for 5V-24V DC input that will run 100% duty cycle at 5V and the 3.3V LDO is a different part as well. No longer have to worry about voltage configuration. 2) Mounting hole sized for a #8 screw to easily mount in CG cases. 3) Fixed the issue with using 3.3v programmers. 4) Fixed a potential issue that could cause the ESP module to hang if a watchdog reset occurred or the module rebooted. 5) All passives are SMD now. Only components left to solder are headers and buttons. ** each box can hold around 15 kits. THT BOM - This is the BOM provided for you to assemble. I'm doing this a little different than most group buys. To ease logistics and keep orders / shipping straight, I've created a Google Form for participants to fill out. I will periodically review submissions, issue invoices via PayPal and update this thread with participants. Please allow a day for me to invoice you. If there are any questions or concerns, please feel free to post about them in this thread. If you have not received a PayPal invoice from me by 12PM EST on 2/11, CONTACT ME ASAP. I have had a ton of folks ask me about these after showing v1 off at LUO ! I am curious, what is the WiFi range here? I mean from a normal router, not something insane line a Ubiquity. I was leaning toward doing a Pi Zero or B2/3 with WiFi dongles. But this looks way smaller and lighter which will play into my concept way better. Downside is it can't run FPP and be self contained. I'm doing this a little different than most group buys. To ease logistics and keep orders / shipping straight, I've created a Google Form for participants to fill out. I will periodically review submissions, issue invoices via PayPal and update this thread with participants. Please allow a day for me to invoice you. If there are any questions or concerns, please feel free to post about them in this thread. If you have not received a PayPal invoice from me by 12PM EST on 8/15, CONTACT ME ASAP. Chris, thanks for your work on this. I've placed my order! Ahh, someone had to be the first person not to read through the instructions! Thanks for letting me know. I've completed the form. Thanks for putting this together. These look great! I just ordered 5 of each. I have been looking forward to getting my hands on a few of these for a while. Last edited by Setarcos; 08-05-2016 at 06:27 PM. The rub is more with the ESP module than the access point. You have to be careful that you don't bury the pixelstick and block the ESP antenna. As with all things wifi it varies a lot. Antenna position, power of the radio, etc. Folks can get a couple hundred feet with no problems, especially if the access point is outside. What are your distance requirements?